CUMBERLAND, R.I.–(BUSINESS WIRE)–Today more than 200 members of the Cumberland community and UnitedHealthcare employees joined the New England Patriots and KaBOOM! to build a new playground at Blackstone Valley Prep’s (BVP) Elementary School 3. Blackstone Valley Prep is a K-4th-grade elementary school in the Providence-based public charter school network of the same name. Known as Elementary School 3, the school is expanding and has moved into a new location that previously housed high school students, yet lacks a playground. The new play space will give the more than 400 students a place to engage in safe and healthy activities. 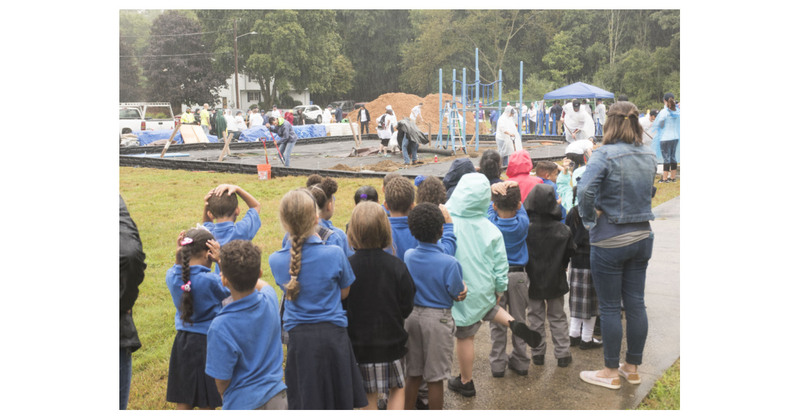 In July, students from BVP’s Elementary School 3 helped design the new 3,000-square-foot playground during a special “design day” event, incorporating new elements such as a triple racer slide, ripple bridge, superdome climber and more. Volunteers worked with KaBOOM!, a national nonprofit organization that helps bring balanced and active play into children’s daily lives. The Boston playground is the 3,099th KaBOOM!-organized build since 1996, the 28th created by KaBOOM! and UnitedHealthcare, and the 9th built with the Patriots. This playground build is part of UnitedHealthcare’s “Do Good. Live Well.” program, an employee-volunteer initiative dedicated to decreasing hunger and obesity, inspiring service and encouraging volunteerism. For more information about the benefits of volunteering and to find opportunities to volunteer alongside UnitedHealthcare in your community, visit DoGoodLiveWell.org. Follow @DoGoodLiveWell on Twitter or “like” Do Good. Live Well. on Facebook.